Whalers were already established at Portland when Edward Henty arrived in November 1834, followed shortly after by his brother, Francis. Favourable reports of the Hentys' progress whetted the appetites of graziers in Van Diemen's Land leading to the formation of the Port Phillip Association. One of its members, John Batman sailed from Launceston to Port Phillip in May 1835 to negotiate a treaty with the Aborigines by which means he claimed large tracts of land in the Melbourne and Geelong area on behalf of the Association's members. The Batman party relocated its initial settlement from Indented Head to the Melbourne site on the Yarra River to discover that another party initiated by Launceston banker and businessman, John Pascoe Fawkner, had set up a settlement just below the Yarra Falls on 30 August 1835. The resulting debate as to who was the founder of Melbourne has been carried on since the early claims of John Pascoe Fawkner to this title. However, as A.G.L. Shaw points out in A history of the Port Phillip District: Victoria before separation, the argument stems from "confusion between the idea of establishing a pastoral settlement in the Port Phillip District and that of establishing a village or township on the site of Melbourne." (p.55). The demand for wool, which was the original inspiration to settle the Port Phillip region, was also the driver for the subsequent pastoral expansion into the western and northern parts of the district. This led to the dispersal of population over a wide area resulting in clashes with the local Aborigines as well as unauthorised and unregulated occupation of land. As a way of addressing the problem, in 1836 Governor Bourke introduced a grazing licence fee and established Land Commissioners, a system which was subsequently expanded by Governor Gipps and his successors. The following sources provide a general overview and access to biographical information and records of a selection of the significant names in Victoria's pastoral history. Until separation in 1851, Victoria came under the administration of New South Wales and was known as the Port Phillip District of New South Wales. By 1842 the Port Phillip region was eligible to elect members to the New South Wales Legislative Council. William Lonsdale was appointed Police Magistrate and Commandant in 1836 and Charles Joseph La Trobe was appointed Superintendant of the Port Phillip District in 1839. His powers however were limited as real authority rested in the Governor of New South Wales. The first chapter of A People's Counsel: a history of the Parliament of Victoria 1856-1900,"Towards Separation 1836-1851", provides a short history of the early administration of the Port Phillip District. A.G.L. Shaw's A history of the Port Phillip District: Victoria before separation contains detailed information on this topic. 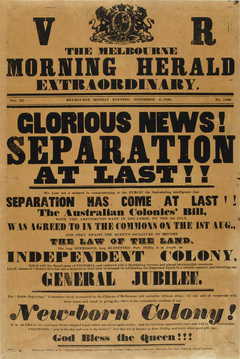 The push by the settlers of the Port Phillip District towards separation from New South Wales began as early as 1839 with pressure being maintained until their objective was finally achieved on 1 July 1851. This subject is included in a number of the sources provided throughout this guide such as A history of the Port Phillip District: Victoria before separation whilst Port Phillip's separation on the State Libary's ergo website provides a useful introduction. The petitions of the district of Port Phillip (Australia Felix) for separation from the territory of New South Wales.